There are dozens of ways to celebrate Christmas. Families have their own traditions passed down for generations. In my small North Dakota town, home to many German-French emigrants from Ukraine, we had several traditions which I treasure. The tree was decorated on December 24 and stayed up until February 2. After dark on Christmas Eve, we gathered around the tree listening for the sound of melodious bells signaling the arrival of the angels. Magically, they appeared in flowing robes, shiny tiaras and wings covered with sparkling stars. They blessed the tree, sang Silent Night in German and English, and presented each child with a gift from Jesus. I can still feel the anticipation in my child’s heart and the sheer joy of that evening. I experienced a similar joy when I received the following prayer-poem from a dear friend. It expresses the reason for that lovely family tradition and the deepest source of our Christmas joy! With permission, I include it here. Different from all other nights? On this night long ago. Every night watching the Channel 11 evening news, my housemates and I are inspired by the stories of people who are making a difference in our world. Sometimes they are celebrities. But often they are ordinary people, girls and boys, seniors, young adults, like your neighbors. These people, however, are extraordinary because they see a need and respond to it. And they involve others around them to spread the care and love. I thought about that after watching the particularly poignant story of 94-year-old Loren Krueger, a retired farmer from Leroy, Minn., who left $3 million to his small town of 95 inhabitants. That act of generosity is amazing in itself, but what the beneficiaries did is even more amazing: they gave most of it to the meet the needs of others in town. Making a difference, seeing a need and responding, inspiring others to do the same. Isn’t this what Christmas is all about? In a divine act of love, God took on our human flesh in order to make an everlasting difference in our world. God so loved the world that the Word of God was made flesh and dwelt among us. This act of generous love is amazing! Shall we look carefully to see that because of the Incarnation everything is holy now, everything is a miracle? Shall we look into the face of a child, at bread and wine, and see that everything is holy now, everything is a miracle? Shall we recognize that seeing a need and responding, inspiring others to do the same, makes a difference, and that everything is holy now, is a miracle to celebrate? 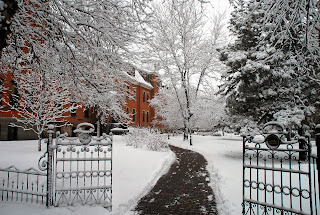 These snowy and chilling December days may be perfect for pondering Advent and Christmas realities. 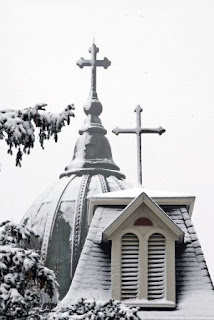 I say that because our Prioress, S. Nancy Bauer, wrote a poetic piece in December 2009 for her Christmas homily. It captured the Incarnation and wintry connections cleverly and playfully. Here are a few of my favorite stanzas. Etching God’s designs on the young woman’s heart. Mary lifts a finger to brush the feathered strokes away. Revealing the shimmering face of God. And carrying on about a baby in a manger? Mumbling, murmuring, muttering, uttering discontent. They gaze and are amazed. Wrapping the world in swaddling clothes. When we have important places to go. Over and over and everywhere. Amen. 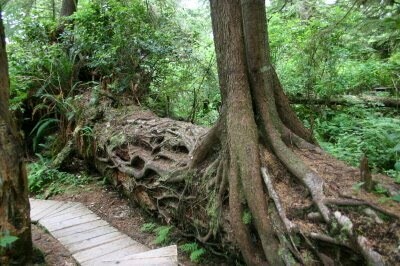 A friend was showing me some pictures recently that she had taken in a rain forest this past year and one of the pictures was of a "nurse log". A nurse log is an incredible phenomenon in nature. It occurs when a tree falls to the floor of the forest and begins to decay. In the process of falling apart it provides nutrients, protection and a root system for a new tree to come to life (see picture). It can take over 100 years for a new tree to root and begin to grow. 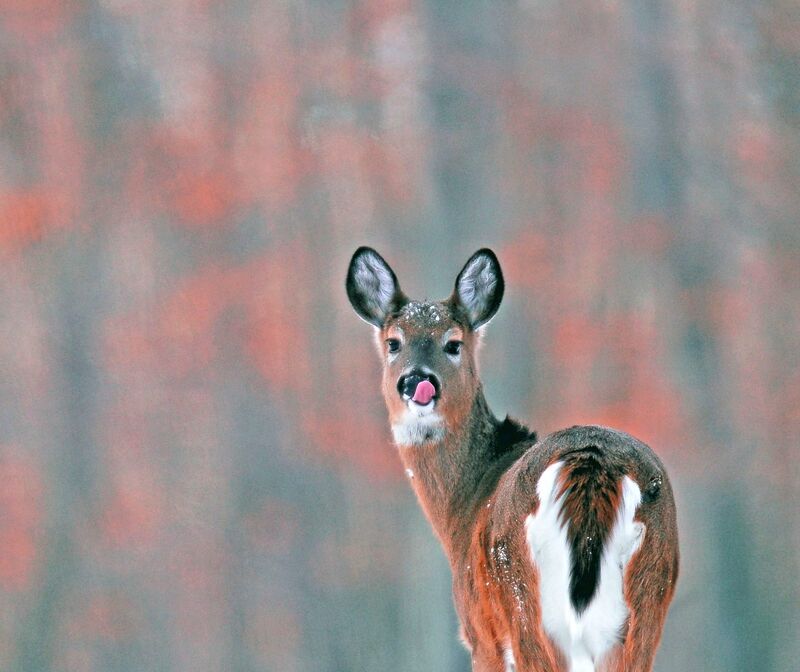 One does not rush mother nature! And so it is with life. After my friend left I kept coming back to the picture she had shown me of the nurse log and soon was pondering the fact that a nurse log could be a metaphor for life. I think of two specific instances; one is what happens when something sad or tragic happens in our life. We are tempted to think that we have come to a dead end but the opposite is true: new life is born from what dies in us . . . a dream, a wish, an expectation, a friendship. The other instance is what appears to be, at this time in history, the end of many religious communities as we have known them in this country and elsewhere in the western world. It gives me great hope to believe that new life is and will be born out of the dying of these communities. As in nature it could take a very long time but as the log in the picture it will happen if we remain faithful to allowing new life to take root. If you go to a Blazers basketball game, you are likely to see Sister Dolores Super in the stands wearing her bright red Blazers sweatshirt. S. Dolores not only loves the Blazers but the Twins as well. She is an all-around team player in community. S. Dolores and I have formed a partnership that makes pot holders for sale at the monastery’s Whitby Gift Shop and through Monastic Enterprises by offering to sew up bindings. With S. Dolores Super joining the team, I have been able to market a few more pot holders. This fall, she often stitched the binding on them with enthusiasm and precision while watching a Twins game. It’s more than a team or market effort, however; it’s also a wonderful way for us to bind our friendship together and share interest in each other’s lives. I am delighted for the extra help, but most grateful for the connection that stitches us together. The Rule of St. Benedict says in chapter 57, “If there are any artisans in the monastery they are to practice their crafts with humility.” We as Benedictine live and think practically. Everybody needs a pot holder; they are small and light, travel well, and bonus cost efficient. All the pot holders are sustainable in that they are made from scraps donations. 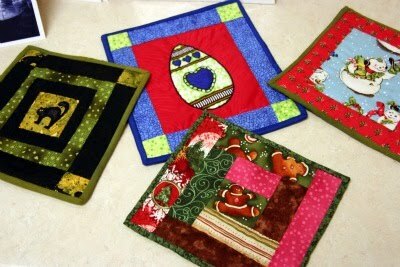 The joy of making pot holders is the creativity and color of each specific pot holder. No pot holder is the same and I am always delighted to hear people say they have a pot holder I made in their kitchen. In my mind’s eye, I know that these pot holders are landing in kitchens around the United States and overseas. As well, they are signed with my embroidered signature. Pot holders have become part of the regular stock at Monastic Enterprises and Whitby Gift Shop. Big quilting projects do happen, but most are in quilting limbo waiting to be finished. … to which I might add: If one pot holder gets a binding, every piece is precise and ready for a household. Every month I look forward to a gathering with my Journey Group, seven lovely women, five from the College of Saint Benedict student body and one other staff member. We are on a spiritual journey together, and every time we meet our combined paths become more and more entwined. We have talked about sundry topics over the past four years, having started in 2007, when the five seniors were first-year Bennies. Stephanie and I are co-facilitators and have been on this journey with the women who will graduate in May. Every month, we have a meal together, and then we spend two hours talking about holy things just as Benedict and Scholastica did in the Life and Miracles of St. Benedict. Because of the disclosures on both our parts, we seven have bonded over important parts of each other's lives. We mean something to one another. We have moved beyond being acquaintenances to deep friendship. And yet, our friendships are not the kind that would cause us to go to the latest Harry Potter movie. Rather, years down the road, we will meet at a St. Ben's reunion and will immediately feel comfortable talking about our spiritual lives. The Journey Groups are a central part of Companions on a Journey, a program that began when the College of St. Benedict received a Lilly Foundation grant for the express purpose of exploring vocation. 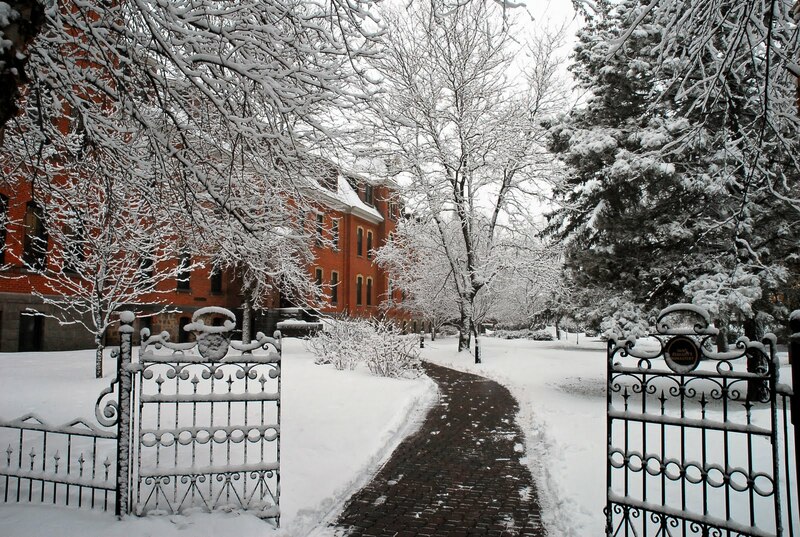 Various liberal arts colleges in the country received similar grants and were given free rein as to how they would express the playing out of exploring vocation. We chose to set up a program of guided spiritual companioning. Since the very beginning, this program has been a success and continues yearly to foster the kinds of close ties I mentioned occurring with my companions and me. Every year that I have participated, I have been especially grateful to be part of this rich experience, but this year, more than any other, I am indebted to my spiritual companions for their dedication to each other. They have shown me the kind of faithfulness I hope for them in the future. With programs of this caliber, the College of Saint Benedict continues to be a very special place. As we enter into this winter Advent, we remember this is the season of grace upon grace – when Christ entered our world and our lives. The dawn of grace has arrived. The first snow has fallen. Friday night we had a beautiful, snowy day. As I watched, the snow fell straight down. At one moment the snowflakes were like downy feathers. There were so many that it was like all the down pillows in heaven had been split open and released from some sort of joyful, celestial pillow fight. The myriad of snowflakes that followed were small as raindrops, yet descending in no hurry. It was as if they were taking their time and enjoying the ride. Can you imagine counting all the downy snowflakes? How can you focus? There are so many moving near and far, left and right, everywhere. Look between pine trees and see the near ones dancing through space. Look up and see the air patterned and moving, jllions of white dots inexorably sliding down the sky. Look across the prairie and hills and up into the gray clouds and feel the immensity of nature. The Presence of God. God’s grace is like snowflakes falling down everywhere on the good and the evil. This is the grace of God: God’s kindness falling down on you from start to finish. It’s not your own doing, yet the patterns of grace descend on you as you go about your way. In the thoughts of loved ones, as you talk to one another, bragging, divulging and struggling. As you play, compete and live together, let God’s saving grace fall upon you ever so gently or in swirling wind. Oh joy!! We get almost a full four weeks of Advent (minus one day). This does not happen often. . .and I usually am bemoaning the shortness of this wonderful liturgical season. Historically, Advent was originally held to be a penitential period, one with an emphasis on our sinfulness mitigated by our fasting. Neither of those aspects is a focus anymore -- at least, not in the church-at-large. In our Gathering Place we have a huge wreath on the center table, instantly capturing the eye as one enters the place. Our practice on Sundays before Mass is to gather round the wreath as the candles are lit—sometimes by a child or some other guest of the monastery. There is a joyous atmosphere overall, and we process into chapel with light heart and step. I particularly like the Advent hymns and antiphons. They are infused with such longing for Christ’s coming and there is a sense of expectancy which overcomes any dreariness of disposition, weather or fears, physical and spiritual. Christ our Light is coming!